At the Lowell Historical Society, we get to see and study some really interesting artifacts, like the wooden stake from the Central Bridge fire of 1882 or the Hi Hat Guy from Lowell’s Hi-Hat Rollaway, or even the Box of Cinders from the Pollard’s Department Store fire of 1926. A lot of these, we inherited from long ago. But, sometimes, ‘new’ old artifacts make their way to the Society. Right before the holidays, we received an email from Ray Leavitt, whose family had come across some employee badges from Lowell’s Merrimack Manufacturing Company, more commonly known as the Merrimack Mills. Lowell’s Merrimack Mills were the first major textile mills to set up shop in what was then East Chelmsford, in 1823. The company grew into one of the city’s largest employers and survived well over 100 years, employing first a generation of mill girls from the rural farmlands of surrounding New England towns and later generations of newly-arrived immigrants looking for a new life in the United States. The Merrimack Mills played a huge role in the development of Lowell, and played considerable roles in the family histories of many who trace their family’s stories through the Greater Lowell area. Ray’s Merrimack Mills employee badges belonged to two of his great aunts and had been kept by their youngest brother until he had died in 1999. Last week, he mailed them to us. When you first examine the badges, their age becomes immediately apparent. There’s no magnetic strip on their reverse, no RFID tag, no protective holograms. In fact, they’re mostly metal and paper. There’s just a little bit of plastic, a small, thin film covering the photos. When Ray and I spoke last week, he estimated them to date from the 1950s. Now that I’ve seen them, I’d agree. The nature of the badges, their crisp black-and-white photographs, and even the fashion visible in the photographs all seem to suggest the 1950s. This means they date from the end of the reign of the mighty Merrimack Mills, which were gone and demolished by the time JFK became president in 1960. The personality of the women comes through the years, through their photographs. 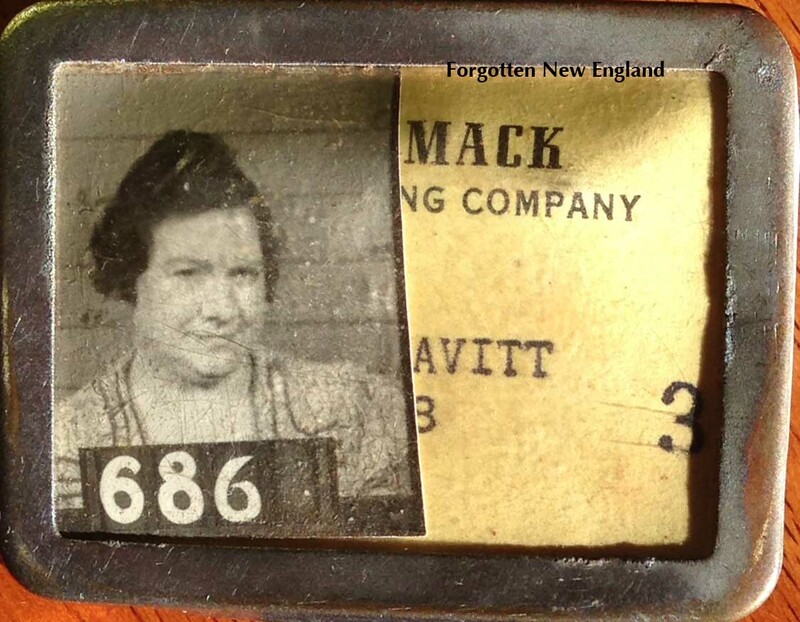 The first badge, #688, belonged to Mary (Mamie) Leavitt. The other, #686, belonged to her younger sister, Catherine, who was known as Katie to her family and friends. Both show shy smiles. The Leavitt sisters were first generation Americans, born to Irish immigrants Michael J. Leavitt and his wife Johanna (Sullivan), who were married at St. Patrick’s Church in Lowell on November 22, 1893. The Leavitt sisters and their three brothers grew up in the shadow of St. Patrick’s Church at a house the family rented that once stood at 222 Suffolk Street. Neither sister ever married. Both worked for the Merrimack Manufacturing Company until it closed. Mamie later found work as a matron at St. Joseph’s Hospital. She died in 1983. Katie died earlier, in 1967. After the Merrimack Mills closed, she found work at the Lowell School Department as a matron. By the time Mamie and Katie worked at the Merrimack Mills, the Leavitt family had left Suffolk Street and bought a home at 662 School Street in the city’s Highlands neighborhood. Both sisters worked as velvet cutters at the Merrimack for years. 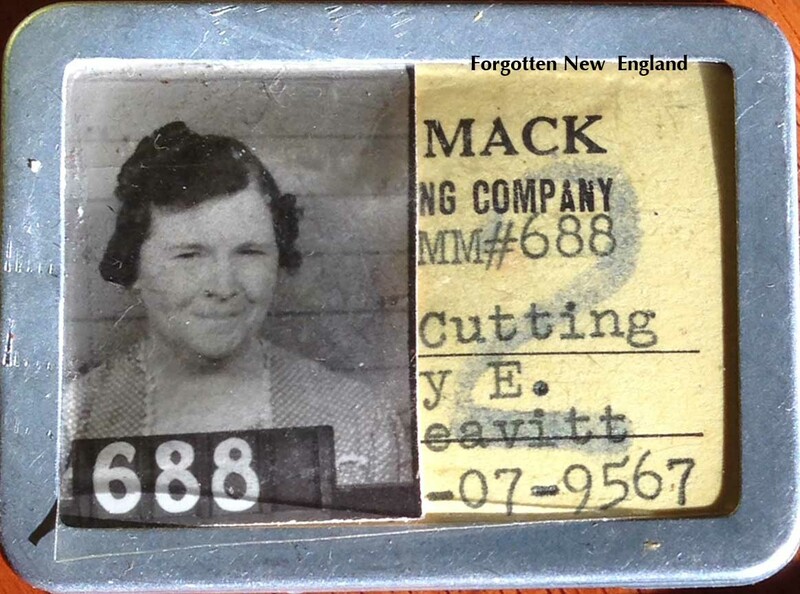 And the Merrimack Manufacturing Company was a big part of Leavitt family life. Family members still recall how Mamie spoke with pride about her coveted position as a cutter there. And family memories include their younger brother Bill Leavitt telling stories about how he would bring lunch to the Merrimack for his sisters as they worked. When the Merrimack Manufacturing Company closed in the late 1950s, its absence devastated the Leavitts as it did many Greater Lowell families. Not only did the region lose a major employer and a source of jobs, but along with the mills left a way of life, and a key component of Lowell’s identity that had existed for longer than the city had itself. I lived in Huntsville, AL for 16 years. It was the first time I was to see raw cotton. I lived in Old Town Huntsville not far from Merrimack Mills. By father worked in the mills in Lowell. I could not get over the fact that I would find myself connecting with a city that had part of my history. I have read books about the history of Lowell and the Irish building the canals and St Patrick’s. Mom graduated from there. When Mom moved back to Lowell in 2012, she was living in the Merrimack River House which was build for the women mill workers. It is a treasure trove of antiques!!! We learned that it was closed this year. I know that there has had no history written about it. Is this something that could be done?? It would make a wonderful Bed and Breakfast!! It was very well maintained. Just wondering.